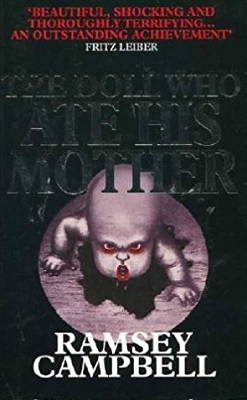 The Doll Who Ate His Mother was Ramsey Campbell’s first novel. The story is set in his hometown of Liverpool and the central character is a young schoolteacher called Clare Frayn. In the first chapter Clare and her brother, Rob are involved in a car accident in the early hours of the morning and Rob dies at the scene. The accident is caused when a strange man walks into the road in front of Clare’s vehicle. If the man is strange, what he does is stranger still because he runs off with Rob’s severed arm. Six weeks later, Clare returns from a visit to Rob’s widow and finds someone waiting on her doorstep. His name is Edmund Hall and he believes that the man who caused the car accident did so deliberately. He even knows the name of the man: Christopher Kelly. Hall and Kelly were at school together and, even as a child, Kelly was apparently a strange and frightening individual. Hall is a successful writer now and he lives in Surrey. When he heard about the accident he returned to Liverpool, intending to write a book about the man who killed Rob and his eventual capture. Hall plans to write the book almost as it happens, but he does not want to share his information with the police. He intends to pursue his own investigation instead and, although he tells Clare that the police won’t want him tagging along and getting in their way, it is obvious that Hall’s real motive for keeping quiet is that he does not want the police to steal any of the glory. Mrs Pugh’s house was situated quite near to where Rob died. She lived alone but kept a bulldog for company. Their bodies were found together in the living room. The Bulldog’s skull had been destroyed by an unfortunate encounter with a building brick, but at least its body remained intact. Mrs Pugh had been partially eaten. Edmund Hall is not a nice man. He is a manipulator and is willing to use anyone to get what he wants. With his skills being what they are it is not long before Clare agrees to help, and people will obviously be more sympathetic about talking to Clare than to him. Once he has Clare onside Edmund is quick to use her to enlist the help of Mrs Pugh’s son, George, who is a nice guy and heartbroken about his mother’s death. When the press gets wind of Hall’s interest in the story that is news in itself and it is not long before a third person also wants in on the hunt. Chris Barrow turns up at Hall’s hotel room and explains to the writer that he believes the person he is looking for killed and snacked on his cat. Edmund takes an instant dislike to Barrow, probably because he was busy trying to force his unwanted attentions onto Clare when Barrow knocked at the door and, although he was getting nowhere, Chris’ arrival removed the opportunity of any further attempts. Clare, on the other hand, likes Chris straight away. He is an actor and seems to be quite sensitive, especially about his dead pet. Edmund may have crashed and burned, but it is clear that Chris has set something smouldering in the young schoolteacher’s heart. The brunt of this story concerns the hunt for Christopher Kelly. The developing relationship between Clare and Chris makes an interesting and diverting subplot. Before anyone can find Kelly though, they need to find his grandmother, because she is the only person who might know where he is. When they eventually do find Mrs Kelly, she has a very strange tale to tell about her grandson’s parentage and his connection to an evil man, who practiced black magic and used dolls to control people. The one about Christ is my favourite. I seem to remember seeing that church on the TV, or perhaps I have driven past it; either way, I had forgotten all about it, but that description brought it back. The Doll Who Ate His Mother is a horror story, but it is not nearly as gory as this review might make it sound. Yes, somebody loses an arm and somebody else is so thrilled to find it that they run off with it. And okay, it is unpleasant to imagine someone looking at an old lady and getting an attack of the munchies, but none of these things are described in long, loving, gory detail. In the case of the old lady, the man who caused her death is just about to climb back out of the window and has one foot on the sill, when he turns back and looks at the body behind him. After a moment, he draws the curtains and walks back across the room. And that’s it. End of scene and end of chapter. Tastefully done. The Doll Who Ate His Mother is horror, but not over the top horror. I can easily recommend the book to any horror fan, along with any other reader who is broadminded and wants to add a little variety to their fiction intake.